Captain John Jefferson Hunt, a seasoned veteran of the war with Mexico and one who had recently ridden the trail from Utah to Southern California, accepted command of a wagon train comprised of immigrants that had come from all points from the east and were poised to complete the final chapter of their journey to the gold fields of California. The party left Salt Lake City in the month of October, 1849. Brother James S Brown, appointed Mormon missionary to the South Pacific Islands, jointed the train as a packer. In his autobiography, Brown describes the trip, events that lead to discontent and the eventual split among the parties. As the train progressed to the south, other travelers came along side, some by wagon and some by pack. One man named Williams headed a pack train and claimed that he knew of a shortcut leading west to Walker Pass and a way through the Sierra Mountains. He showed them a map that he had acquired giving vague directions across unspecified terrain. Some of the immigrants, soured by the slow progress that had been made, became excited at the prospects of opening a new trail to California -- a shorter pathway to riches. Meetings were held to discuss the matter and parties began to separate into those who favored going by way of the map and those favoring the road south. Brother Hunt warned those determined to leave that there was no trail to follow and that watering places were unknown. Never the less, all but seven wagons turned to the right and headed toward the Nevada desert and Death Valley. In Hunt’s prophetic words, “they’re headed into the Jaws of Hell”. The remaining south bound wagons continued on and soon joined the Spanish Trail that lead to the Vegas Valley (Las Vegas) where they camped and stayed a few days to refresh the animals. According to Brother Brown, after leaving the Valley the wagons crossed a very sandy desert to Salt Springs where the train went around a point of the mountain. Brothers Pratt and Brown and three other men followed a “…small trail that passed over a notch in the mountains”. While going through this narrow pass they noted a ledge that they decided to inspect for gold. They found some promising ore in the crevices and went back later that day with tools to collect more samples. The wagon train moved on to Bitter Springs the next day; leaving the gold for others to claim. Salt Creek sluggishly flows through the narrow defile (where the gold was found) on a course south to a point where it spreads out over a salt flat. The early caravan pack trains that forged the Santa Fe Trail probably followed down and camped along the creek bed. Wagons, by contrast, would have found that trail too narrow and bolder strewn. The Hunt Wagons were thought to be the first to follow down along the west side of the point of the mountain and camped near water. Through use, the trail widened to became the main wagon route between Salt Lake City to Los Angeles, and Salt Creek became an important stop on the way. Hunt’s wagons covered the remaining distance in good shape, crossed Cajon Pass arriving at the Williams Ranch in Chino on December 24, 1849. And, before the mule traces got unhitched from the wagons, word of Salt Creek gold had sprung loose and spread like prairie fire across the southern valleys of California. Taking only enough time to gather a few provisions, worthies of all strip, young and old, commenced their journey up over Cajon Pass, down along the Mojave River and on to the dry untamed Amargosa country. The mayor of Los Angeles, Benjamin Wilson, was among them. On returning to his fair city, Wilson claimed there’s a whole mountain full of gold out there but the cost to bring it out would not be worth the effort. Other gold seekers came to the hills with the hopes of finding a way to reduce the ore and make a profit. Lt. Sylvester Mowry, a recognized name in western lore, camped at the creek in 1855. Ordered to leave Salt Lake City due to his romantic inclinations toward one of Brigham Young’s daughters, he was hurriedly placed in charge of a column of green recruits and sent south to Fort Tejon. In his report he mentions what he found at Salt Springs …”we found the ‘sign’ of gold … Here Ben Sublette, a note mountaineer, with a party worked in the 1850–51 & 52 with great successes.” He mentions that the place looks like the miners had left in a hurry leaving “…an amalgamator, mining instruments, spades, blankets, rough furniture and a small block house with its doors wide open invite in vain a renewal of the enterprise” He believed that the miners were scared off by Indians. By 1860, a sizable number of investments had been made. The rock and adobe ruins, on the hill overlooking the mines, took form around this time and I believe it to be the oldest standing abode in the California Desert. With a 12 x 60 foot base, three rooms, two fireplaces, and thick walls, built to withstand attack from any quarter, it became known as the Fort. 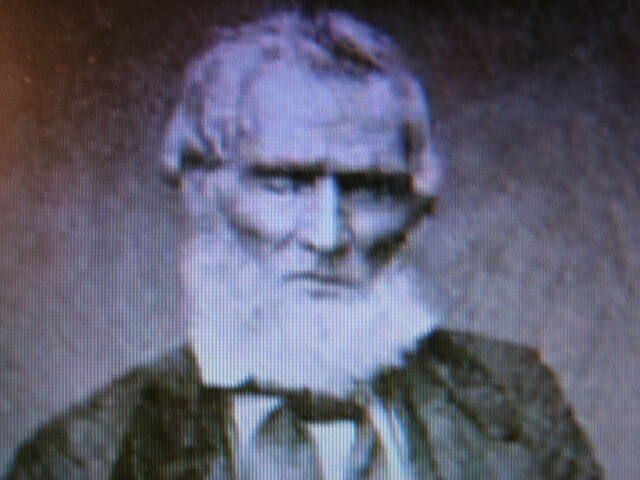 Brother Brown, upon completing his mission to Tahiti, was sent by Brigham Young to have another look at the gold prospects in Salt Creek Canyon. He found the abandoned mines and correctly reported back that there was nothing left to develop. Though success never crowned their efforts, miners and prospectors continued, until recent years, to work these diggings-- hopes never die when it comes to gold. Those that took the route to the west suffered soon after departing. All but 27 wagons turned back to rejoin the trail south. Weeks later this group, foot sore and out of food, caught up with the Hunt train in Cajon Pass. The wagons that continued to the west followed different routes but all eventually found themselves at the edge of Death Valley. Years later, survivors would tell their survival stories in magazine articles, books and at 49er celebrations held each year around Christmas time. Salt Creek Natural Area is well managed by BLM with a maintained road to the parking area and a signed nature trail along the creek and over to the mines. The turnoff is located on the east side of Highway 127 approximately 28 miles north of Baker California at Google Earth 35 37.342; 116 17.035.